Max. RPM: 12,000. Arbor: 5/8in. 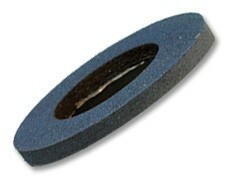 PVA MS Style - Marble Edge Polishing System. Alpha PVA MS style is a dry polishing system used to polish marble edges and is ideal for baseboard, corner and countertop edge applications. It is also excellent for job site touch-ups. Fast working and long lasting, Alpha PVA MS is easy to use and works well on most common high-speed grinders. It can be used for other applications such as the edges of ceramics, woods and metals. It can also be used for paint removal, as the material will not clog. Marble shops will find Alpha PVA MS very effective on contours, edges and irregular surfaces such as chamfers, bead molding, and other types of curved or rounded edges. Tile and floor installers will find that Alpha PVA MS works great on the profiled edge of baseboard tiles. 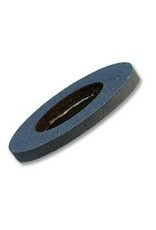 All users will find this product is ideal for use in conjunction with the Marble Profile Wheel. Alpha PVA MS is formulated with a silicon carbide abrasive and a polyvinyl alcohol bond that is color-coded for ease of operation. The combination of this bond and abrasive give Alpha PVA MS a long life at an affordable price. The PVA system provides a great polish on marble edges without the difficulty or mess associated with wet polishing techniques. Backplate only comes with set #12506.